Is an Exclusive, new, spacious, detached villa with stunning Panoramic sea and mountain views. Furnished with locally hand crafted tasteful, modern furniture. It sleeps 2-7 comfortably ( adults and children ) plus a travel cot can be made available if required. The villa has its own private swimming pool - 4 x 7 metres. - there is a wall surrounding the plot keeping most of the garden private from neighbours but still allowing the fabulous view. Perfect for barbeques. There are sun-loungers available, pool toys and inflateables, a play area with various toys. Inside there is a selection of DVDs and videos, board games and guide books for the guest to use . A car is essential as the climb up the hill to the villa is steep but well worth it when you see the views. The villa is ideally located to the centre and north of this charming island and very close to one of the longest beaches in the med - where turtles are known to nest - just west of Rethymno. An historical harbour town 10 minutes from the villa, which is the smallest and arguably the prettiest of the three main Cretan towns, with its palm lined prominade. It is a haven that attracts locals and visitors alike to its waterside tavernas. The old town is marked by the ancient fortress, old harbour, winding paved streets, fish restaurants, cafes and bars with plenty of nightlife, it provides all the modern and cultural amenities youll need. Join in the cellebrations at the Rethymno wine festival in late July and witness spectacular Greek dancing and free flowing wine. The unique location of the villa allows the guest to visit places such as the world famous and much visited Minoan ancient Palace of Knossos, the Monastary of Arkadi, and the Samaria Gorge - europes largest ravine. With normal everyday sights such as the traditional working villages of Spilli and beautiful resorts that have so much to offer all ages and tastes alike, such as Bali, Georgiopoulis, Agia Galini, Malia and of course the nearby Platanias. Platanias, only 5 minutes away is a pretty resort and perfect for families with its gently shelving sand and also ideal for watersport enthusiasts or sunworshipers! Around the island there are waterparks for children or the child in us. There are boat trips to other parts of the island - and other islands! Santorini Island for example is easily accessable for a day trip. Or you could simply laze by the pool at the villa soaking up the fantastic scenery right on your doorstep as you totally relax and recharge your batteries. ... with this beautiful, sunny, magical diverse Greek Island of Crete as soon as we visited it many years ago. Then many years later we found our ideal plot of land to have this brand new stunning villa built. With a fabulous location like this you cant go wrong, panoramic views of the sea ( to the left), of the mountains ( to the right) and the village straight ahead across the valley, set in an area surrounded by orange, lemon, lime and almond trees set amongst olive groves. As a visitor you are genuinely welcome, so take up the invitation to join the locals for a glass of raki and share in the spirit of Crete. There is a very comfortable sofa-bed in the large spacious lounge. Picnic sets are available if you plan days out and want to take your lunch with you. Ceiling fans are in each of the bedrooms as well as 2 in the lounge, which are efficient at keeping the rooms cool, however air conditioning is provided in all the bedrooms if you wish at a charge and is payable locally. The villa provides the guest with everything you could possibly need for a relaxing chilled out holiday.If you wish to use the cot you will need to supply your own linen for this. 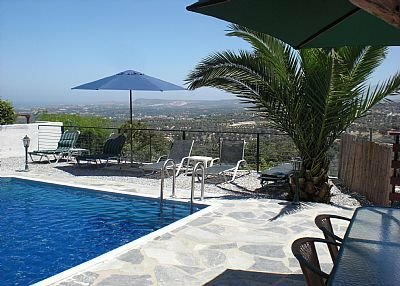 You will need to supply your own pool/beach towels as these are not included in the cost of renting the villa.